The colour challenge for March at White with One is Crispy Lettuce, lots of lovely fresh green colours. I used two cute photos of Chelsea wearing my headband, makes her look much older than 2 years old. 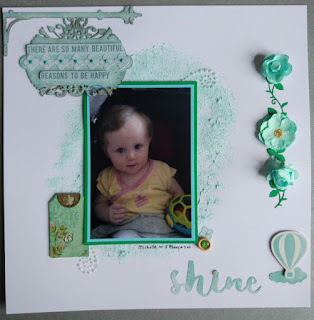 I like the darker green of the wall beside her against the lighter greens I used. I managed to use some scraps of green I have and struggled with a title as many of the green alphas I wanted to use were gone, so a little title is best. This is so cute!Love the butterfly!Thank you for joining us at white...with 1! Such sweet pictures! Love the banner you've done across the top. For future pages, if you don't have enough alphas in the colour of the month you could either mix and match (ie. all different greens) or use a neutral colour of white or black. Thanks so much for joining in with us for the White ... With 1 March challenge! This banner is so cute and your little one is really sweet! Thank you for joining at WW1 this month! What a sweet page. I love your use of patterned paper and subtle embellishing. 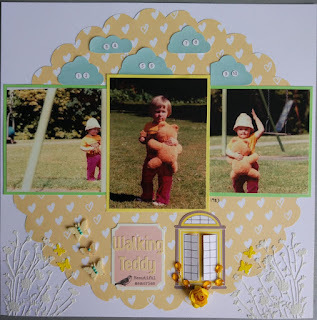 Very cute - the layout and the pics. Love the little trail of twine on your butterfly. Such a cute detail. Thanks so much for playing along with us at White with 1 this month.